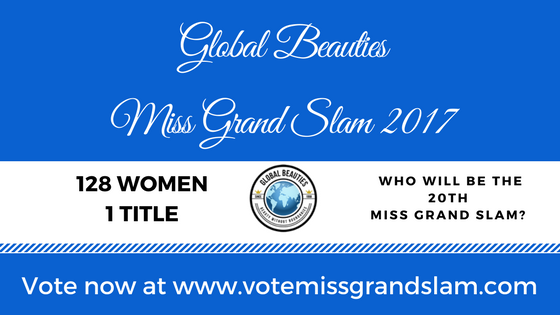 We are moving ahead with Round 2 of Miss Grand Slam 2017. The winner of the online fan vote of each group will automatically advance to the top 32 and third round of the competition. Each fan will be granted one free vote. Additional voting packages are also available. * Voting will be open for a week for Group 7 and the poll will be closed on 15 May. WHO IS COMPETING IN ROUND 2 GROUP 7? The Times of Beauty founder, director and editor Edwin Toledo from Puerto Rico has been a pageant fan and blogger for more almost 15 years. From India we have Dipak Shahi, the co-owner of The Great Pageant Community. Former pageant co-ordinator, trainer and stylist who worked with beauties in Tahiti and New Caledonia for Miss World and Miss France, Heiarii Robson. Stavros Nikolaou was born in Cyprus but he is currently a journalist, television presenter and model in Greece. Author of Misdemeanours - Beauty Queen Scandals Sally-Ann Fawcett from the United Kingdom is also joining our panel. Stephania Stegman was the first woman from Paraguay to win Miss Supranational in 2015 and she was also the first (and so far only) woman from this contest to take home our Miss Grand Slam title in 2015. We also have our fan judge, Gregoire Galli from Nice, France. He enjoys beauty pageants because they bring his two passions, fashion and make-up, together. What he loves most is that ideal of beauty has changed over the years and that it keeps evolving as the world become more multi-cultural and accepting.